The kidneys perform many essential tasks. They filter out toxins and waste products from the blood which are then excreted from the body as urine. The kidneys help control blood pressure by regulating concentrations of salts and water in the body as well as producing hormones which aid the production of red blood cells. When Kidney disease occurs, these regulatory functions are affected and cause the build up of toxins in the dog’s blood. Chronic kidney disease develops slowly over time and generally affects older dogs suffering from another underlying disease. Acute Renal (kidney) Failure occurs over a matter of days. What are the symptoms of kidney disease or renal failure? 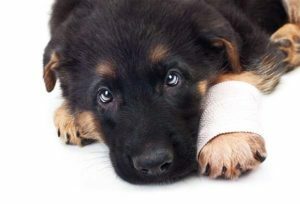 Unfortunately, a dog will only start to show symptoms once approximately 75% of their kidneys are irreversibly damaged. As soon as your pet appears to be showing any of the above signs of renal failure, take him to your vet immediately. What are the causes of kidney disease in dogs? What are the risk factors of kidney disease in dogs? Chronic kidney disease is more common amongst older dogs and dogs who have suffered previous incidents of acute kidney failure. Certain breeds of dog, such as beagles, some breeds of terrier, Cocker Spaniel, Dobermans, Golden Retriever, Labrador, Miniature Schnauzer, Newfoundland, Rottweiler, Shih Tzu and Standard Poodles, are known to have an increased susceptibility to developing kidney disease. The vet will take details of any symptoms your dog is showing, undertake a thorough examination, check blood pressure and take blood and urine samples for a complete blood count test and urinalysis. Your vet may also recommend an x-ray or abdominal ultrasound to help identify whether both kidneys are affected and any abnormalities or masses that may be present. Other tests can be done for antifreeze poisoning and rule out any possible causative diseases such as leptospirosis and Lyme disease. A biopsy of one, or both, of the kidney’s may be felt necessary as a biopsy can be very helpful towards diagnosing the extent of disease and what treatment to proceed with. What treatment can be given to dogs for kidney disease? Treatment depends on the cause of the kidney disease and extent of damage already suffered. A dog with acute kidney failure is highly likely to require hospitalisation to receive intravenous fluids and possibly supplements to restore electrolyte levels and medication to relieve discomfort and control vomiting. After 24-48 hours from the first bloods being taken, further bloods will need to be tested to see if the dog is responding to treatment. If there are improvements and your pet can produce urine, this would indicate the kidney is regaining some of it’s function and recovery is likely. If there is no improvement the prognosis is not good. Where kidney failure has been caused by poisoning, peritoneal dialysis treatment can be very helpful. This involves injecting a special fluid into the abdominal cavity through a catheter. The fluid absorbs the toxins and then is removed through the same catheter after a period of time. A dog with chronic kidney disease may also need to be hospitalised if he is dehydrated. It is likely that your pet may have lost weight. If this is the case, he will be given appetite stimulants together with a specially formulated and calorie rich diet. Your pet’s medication will depend on the cause of the kidney disease, as well as the stage of the condition and symptoms he is showing. Kidney disease, acute or chronic is a life-threatening condition and requires urgent treatment if your pet is to recover. If it is left untreated, it is fatal. How to prevent kidney disease/renal failure in dogs. Many cases of acute kidney failure are caused by poisoning from toxic substances such as antifreeze and rat poisons. Certain foods such as raisins, grapes, chocolate and some plants are also poisonous to dogs. Keep your pet safe by keeping these substances out of reach and away from areas your dog has access to. Ensure your dog’s vaccinations are up to date and that he receives a healthy diet. Take your dog for an annual check-up, especially as they get older, as a simple blood and urine test can pick up any early signs of disease.